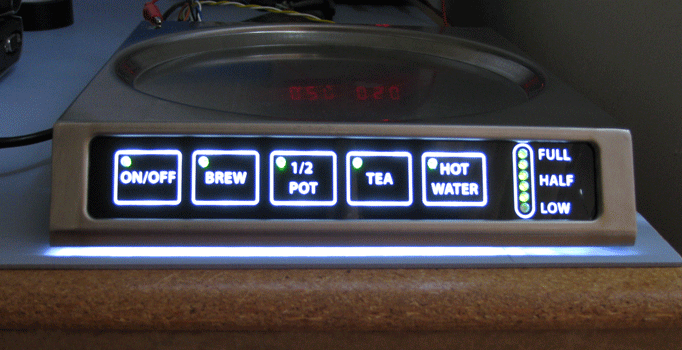 Rapid Keypads can add lighting to your capacitive touch keypads and control panels. Since our capacitive touch system can sense through non-conductive materials, we can put our lighting layer on top of the button sensor. This puts the lighting layer closest to the graphic overlay making it the brightest available. In addition to our uniform, diffuse lighting of the full keypad, we can selectively light specific keys as well as add indicator lights to show status. 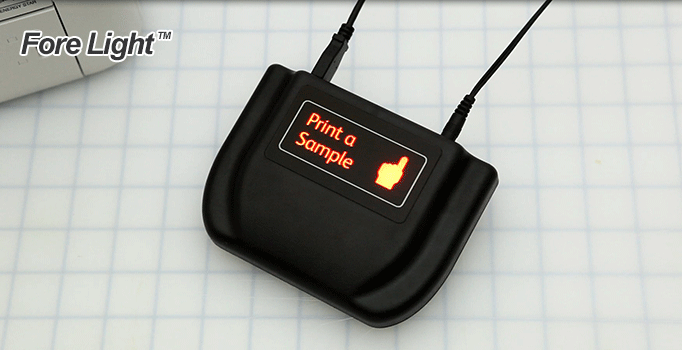 Fore Light™ is an easy way to illuminate your capacitive touch PCB keypads. This technique allows for uniform and diffuse illumination over a large area making it perfect for button icons and logos. This method is generally used for illuminating button icons in dim or dark environments. For example, in automobiles, when the head lights are turned on, the instrument cluster and button control icons are all illuminated. We design and manufacture a special custom lighting layer that makes LED light uniform and diffuse. This lighting layer is sandwiched between the PCB and the Graphic Overlay. Selective lighting is simply the ability to control the illumination of individual button icons. With translucent white button icons you will be able to still see them even when the back lighting is off. This method is used when the illumination of a button is meant to show the status of that button. We can use different colors of light produced by RGB LEDs to indicate multiple modes of operation. An example of this is the call button in an airplane, when the button is pressed it illuminates. Selective lighting is simply the ability to control the illumination of individual button icons. The Dead Fronting technique is the ability to control the visibility of button icons or logos. We have perfected the Selective Lighting and Dead Front Techniques using Glass and Plastic overlays. Now you can illuminate button icons separately and when that illumination is turned off, the icon disappears into the background. Not only does this add a futuristic look and feel to your product, it also can be used to simplify the operation of your product. By illuminating function specific buttons you can make your control panel easy to operate. 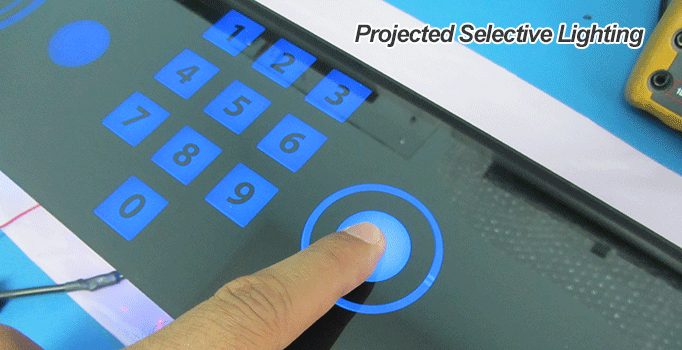 Projected Selective Lighting is an easy way to illuminate your capacitive touch Film keypads. This technique allows for the individual illumination of button icons and logos. We design and manufacture a special custom lighting spacer layer that positions the LEDs at the appropriate distance from the graphic overlay in order to produce a uniform and diffuse lighted touch interface. This lighting spacer layer is sandwiched between the PCB and the Graphic Overlay / Touch Sensor Film assembly. Indicator LEDs are a simple way to communicate button status. Bi-Color or RGB LEDs can be used to provide even more information to the user. 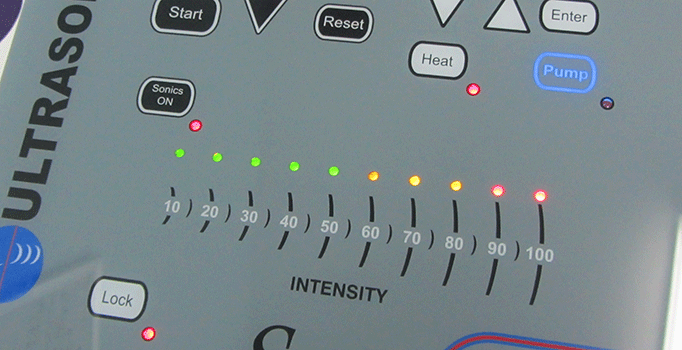 Indicator LEDs can be used with either PCB or Film type capacitive touch systems. A great example of this in automobiles is the cruise control or defrost buttons. Usually these buttons are illuminated with an additional indicator light. When the cruise control or defrost are active the indicator light will be turned on. 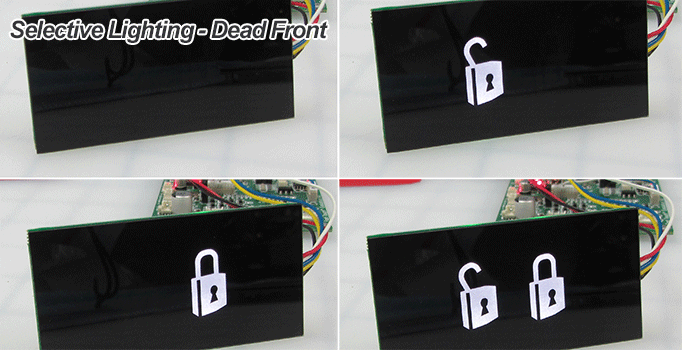 For instance, consider the video of a capacitive touch keypad we developed recently. 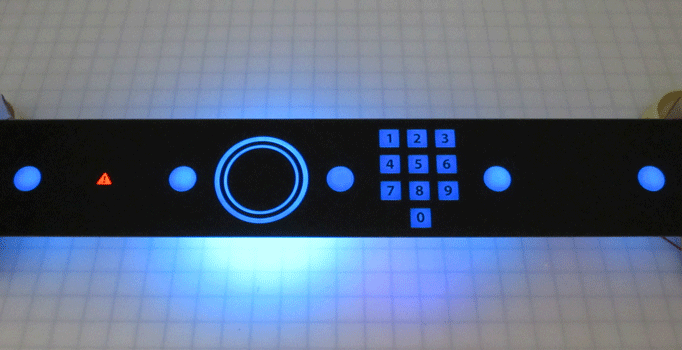 This keypad is a very good example of our complete touch panel backlighting. As soon as the interface is powered on, the backlighting turns on and the brightness slowly increases till it reaches its maximum. We refer to this as the "soft on" or "wake up" effect. As long as the keys are being used, the keypad stays at its maximum brightness. If the capacitive touch interface remained inactive or there were no key presses detected for a certain period of time, the backlighting begins dimming and finally turns off. We refer to this as the "soft off" or "sleep" effect. The user then reactivates the interface by touching any one of the buttons and the backlighting exhibits the "soft on" effect. In certain applications, select keys of the touch interface needs to be lit up to indicate the state they are in. The mute button in a multimedia keyboard is a great example of such a key. This is demonstrated in the video below. We can see how when the mute button is pressed, the key is selectively lit indicating the sound from the computer has been muted. Customers should note that adding selective lighting to a keypad will increase the cost of the keypad during the prototyping and production stage because of the added complexity. Even in a well lit room, it is easy to see the uniform lighted logo flash and change colors. 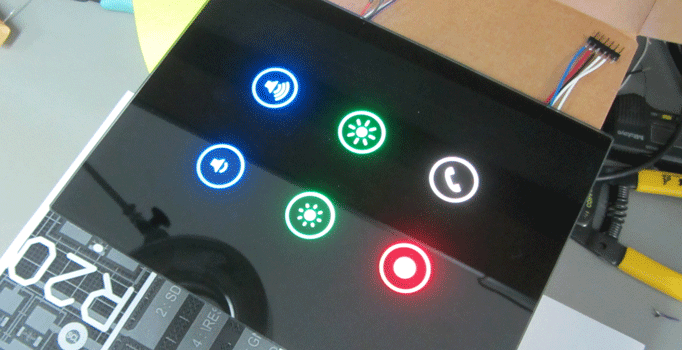 The LEDs used in our interface can also be RGB LEDs. This is especially useful while creating a slider for position control. The slider LEDs could be all lit in a particular color (blue), and when the user chooses a position it could be lit up in a different color (red). A picture illustrating this is shown above. Various color LEDs on a slider could also indicate the intensity level at which your device may be operating. For instance, green LEDs could be used to indicate acceptable, lower or safer operating ranges, while red LEDs could be used to indicate not acceptable, higher or dangerous operating regions. This video showcases an example of a capacitive touch slider interface that uses indicator LEDs to control the operation of a sonic generator. The lower operating regions are indicated by green LEDs, while the higher operating regions are indicated by red colored LEDs. Your project may need to indicate the status of a particular feature in addition to complete back lighting. 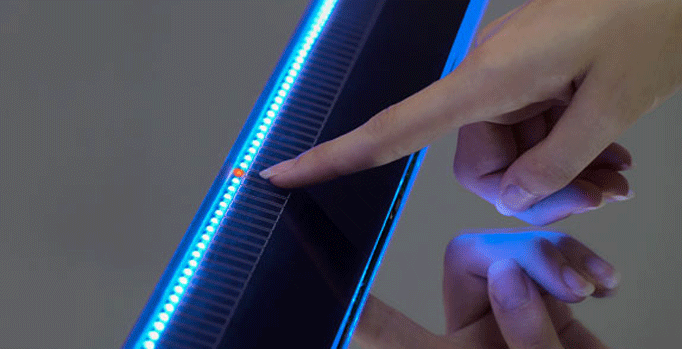 This can be easily accomplished by using our capacitive touch interfaces. In this example, we used Bi-Color LEDs to indicate two different states of each button. Several more states can be displayed by flashing these indicator lights. For demonstration purposes we have modified this product to show latching, momentary and back light dimming effects. The last part of the demonstration shows how we can use indicator LEDs to show the level of fluid in the device.